With the start of 2018, we bade goodbye to some fashion trends and welcomed new ones. this year a variety of pants with distinct cuts and fabrics have taken up the racks. from cigar pants to tulips also known as dhoti pants and from culottes to gharara pants each one has its own unique look and can be carried off at any event with grace. But the most popular one which has taken the lime light are gharara pants.Its a true saying that old is gold. Ghararas were a must for our nanis and dadis in their wardrobe and now its an essential for us too but with a more modern touch to it. its more sleek and slim and of course wearable too. 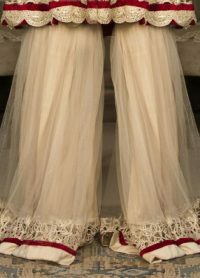 either you have to go to wedding or a lunch or a dinner gharara pants wont let you down. it just adds an extraordinary touch to the dress giving you a more sophisticated yet stylish look.latest trends come with an expiration date so ladies before it expires get your hands on them to give your dresses a unique presentation.